However, this is not a review of a cross-seasonal classic with much more dark elements to it than you would expect for a children’s film. Instead, this is about a more recent film that was released late 2014, yet didn’t enjoy the same level of success as some of some of Burton’s earlier films (Batman, Charlie and the Chocolate Factory, Corpse Bride, etc.). I believe that it’s still worth a watch. 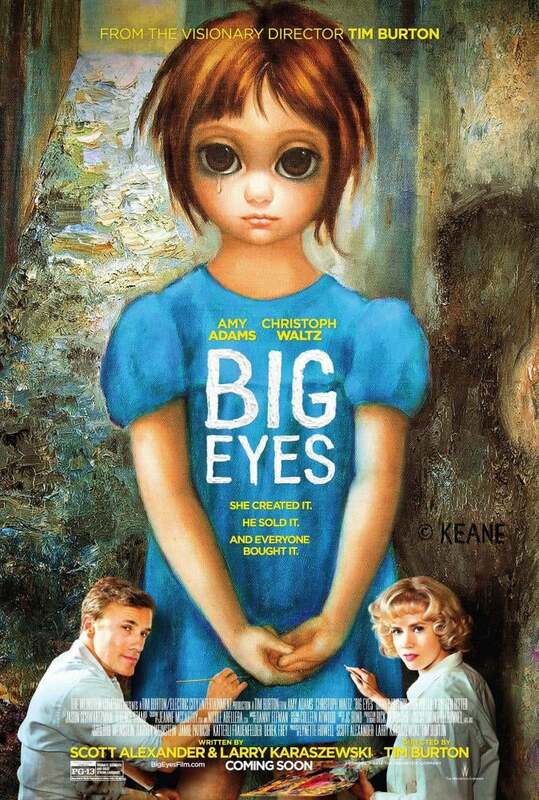 Big Eyes is a biographical film based on the life and career of Margaret Keane, an artist who became wildly successful in the 1950’s and 1960’s. After a previous marriage that she left together with her daughter, she met the charming Walter Keane, whom she thought was also an artist. (He wasn’t) She quickly fell in love with Walter after he promised that they would live a comfortable life, and married him. Margaret was struggling to pay the bills, raise her daughter well, and keep her apartment in San Francisco. It didn’t help that she didn’t have much qualifications, due to majoring in an artistic field in college. She worked at a children’s crib manufacturer painting pictures on cribs. In her free time, however, Margaret enjoyed painting portraits and selling them for money along the San Franciscan beach. Her unique style of art often featured melancholic-looking girls with oversized eyes. which eventually caught the eyes of the wealthy of San Francisco, and almost overnight her paintings and reproductions were being sold everywhere. But there was a catch- people didn’t know she was the painter. Margaret’s husband, Walter Keane, was not a great painter himself, but was an extremely persuasive and cunning salesman. Margaret was the original painter, but she always signed them “Keane”. Walter was the one who first went out and tried to sell Margaret’s paintings, which he recognized had true potential. Since the 50’s and 60’s was still a time where people subconsciously perceived women as less creative/intelligent/etc. when compared to men, the first buyers assumed he was the painter. Walter didn’t correct them because he feared that people would lose interest in the paintings if they knew a woman had painted them, and before he knew it, he was raking in hundreds, if not thousands of dollars. For the sake of keeping their reputation and the money, the two reach an agreement: Margaret would spend her days in the attic painting her iconic paintings, and Walter would go out and sell them. However, as time went on, Walter became more and more abusive, shutting Margaret in the attic for most of the day and preventing Jane, their daughter, from visiting her. Walter did not take criticism well, and eventually became an arrogant, unpredictable control freak. The stakes grow higher and Margaret becomes more and more fearful for her and Jane’s safety. When Margaret uncovers a lie that Walter tried to hide in the past, she confronts Walter, several other things go wrong, and eventually Walter tries to burn down the house and Margaret and Jane flee. What happens next? You can find out for yourself by watching Big Eyes. 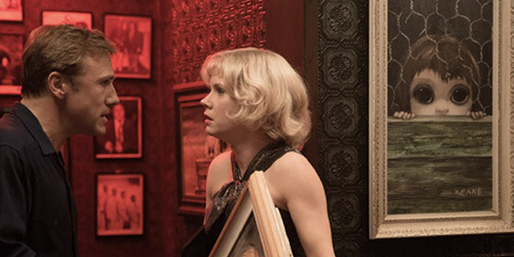 While I enjoyed Big Eyes, there are several things I believe could have been done better. The movie was not the best in terms of writing and didn’t appeal as much to the audience as it could have. There were also several historical inconsistencies between the movie and the true story. Overall, however, I found this movie memorable. I had never previously heard of Margaret Keane, or imagined a scandal like this could occur. The actress behind Margaret (Amy Adams) and the actor behind Walter (Christoph Waltz) both did extremely good jobs, as you can see from their Golden Globe award and nomination, respectively. The music and pacing were both very pleasant, and the sets and props do conjure up a nostalgic feeling for San Francisco in the 60’s. But what really stood out to me about this film, and in fact the reason why I even knew it existed in the first place, was this girl right here. Delaney Raye portrayed young Jane, the daughter of Margaret, in the movie. She doesn’t have that many lines in the movie and gets much less screen time than Margaret or Walter, but young Jane is the character I remember most from the movie. Why? Because the actress portraying her was one of my classmates from elementary school. I didn’t get to know her that well because I was only at that school for 3 years, but I remember everyone in the class making a big deal out of it in 6th grade (Back in that school district, you could’ve gone to middle school in 6th grade or chosen to stay. Most people stayed) and that was when I first heard about this film. Up until that point I never realized I could have been going to school with someone that was in a Hollywood movie directed by a famous director, but when I found out it was true I suddenly became interested in seeing Big Eyes. However, I forgot about it for a couple of years after I moved away (to here), and then it popped into my memory out of nowhere and I decided to watch the film— and was pleasantly surprised by how compelling it was. Overall, I’d definitely recommend this film. It may not have the elements of romance or adventure that many people seek, but if you do take the time to watch Big Eyes it might just take you by surprise. Be warned, though, it does have swearing and some suggestions of violence. Big Eyes is available for checkout from the Mission Viejo Library. Posted on January 16, 2018 by Kobe L.
I watched the move Lion with my family. 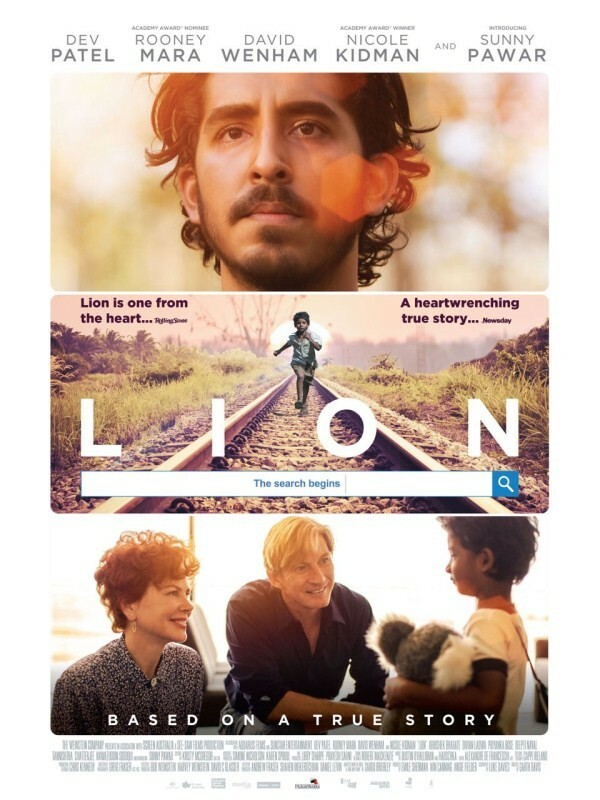 It’s about a 5-year-old boy named Saroo who gets lost on the streets of India, put into an orphanage, and is eventually adopted by a family in Australia. As he becomes an adult, he starts to wonder what happened to his biological family and begins to search for his old home. After a long effort, he is eventually reunited with his family. However, this simple story seemed to us much more dramatic as it was based on a true story. I don’t know how much fiction and storytelling effects were added to this story, but it is a very moving and emotional movie anyways. In the beginning of the movie when the boy Saroo got lost in the streets and was in grave danger of being kidnapped, I almost stopped watching the movie as it was quite terrifying and intense. It felt really realistic, and the terror and loneliness that Saroo experienced could be felt right through the screen. Both Sunny Pawar (the actor who played young Saroo) and Dev Patel (who played older Saroo) successfully played their part. The emotion Dev Patel was able to portray in his performance really pushed the movie forward and was a wonderful addition. Similarly, the shockingness of Saroo being able to use Google Maps to pinpoint the location of his old home was another great aspect of this movie. 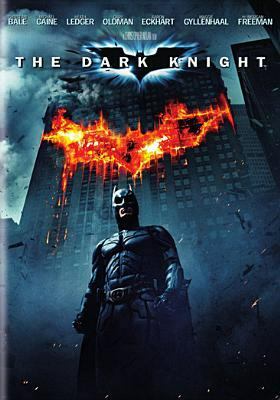 The scene where he was flooded with memories of his past and is able to finally pinpoint and track down his old home was a great climax of the movie. Lastly, the scene where Saroo is reunited with his family was so powerful and moving, and brought me to tears. The joy in the face of him and his mother–though they were actors–felt real and was a great ending to the movie. The revelation that his real name was Sheru was an interesting fact and its meaning that was revealed in the end credits wrapped up the finale of a great movie. I highly recommend watching this movie. If you do, you will get to learn what the name “Sheru” means as well. Lion is available for checkout from the Mission Viejo Library. Posted on January 13, 2018 by Max U. 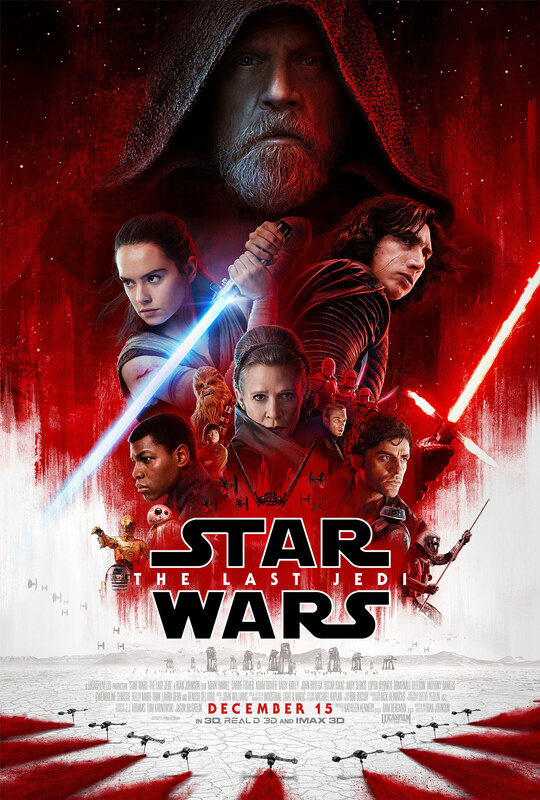 Star Wars: The Last Jedi was a really great film, but as a classic Star Wars film it really didn’t strike me. That’s the problem with many fans. They are torn between whether they should like this movie or not, which is why I’m writing this review. After I saw the movie, I was a little confused. The whole point of the movie was about admitting your mistakes and finding yourself. They where the two big main ideas that made an impact on the story. Other people were mad with the choices that director Rian Johnson made. Fans where stating that The Last Jedi didn’t live up to The Empire Strikes Back‘s name. Which they where right. It was a perfect film to have in the middle of a trilogy. Even more fans just wanted to see J J Abrams direct the movie. He was wonderful with The Force Awakens and I wouldn’t mind if he directed the next trilogy. If there are any J. J. fans out there don’t worry, he is directing the next movie. Rian Johnson changed Luke’s character a little bit to be very funny on the big screen to balance his inner conflict. People were still having trouble understanding Luke’s character in the movie. Even Mark Hamill didn’t understand why Johnson put him in the position he made for the movie. Fans strongly disagreed with Luke in The Last Jedi. Ryan Johnson also made the planet that Luke was on with a lot of detail. For example in the background you could hear the Porgs do their little cry. But hands down it was an excellent film. I just wonder what Rian will do with the next trilogy considering the events that close out the movie. This was the longest Star Wars movie we have gotten but if you’re patient and a huge fan of the franchise, then I recommend you see it. Posted on September 9, 2015 by Leila S.
The Prophet, adapted from Kahlil Gibran’s work of the same name. Kahlil Gibran is a Lebanese-American writer, poet, and artist, whose best known work is The Prophet. Published in 1923, this is a collection of “poetic essays” on various life topics, including love, death, marriage, children, work, and freedom. So when I heard that this book was made into an animated film, I was eager to see it. I was impressed by the film. I have not seen a lot of movies where the theme is comprised of feelings and ideas, so I felt that the way the film was portrayed was effective. The story followed a young girl named Almitra, who had been mute ever since her father died two years before. She steals from all the bakers/shops in the village, causing her and her mother to gain a bad reputation. One day, instead of going to school, she follows her mom to a cottage, where Almustafa has been kept prisoner for seven years. Though she doesn’t speak to him, they connect, and he begins to tell his tales, in the form of poems and songs. What I liked about those parts was the pictures representing the theme of the song. Some were paintings that morphed into different scenes. Others were geometric shapes, like colorful birds and profiles of people. The film was very enjoyable. I appreciated that there was a plot, though a rather simple one, which accompanied the philosophical teachings of Kahlil Gibran. Because I am still relatively younger than the average audience for the book, some of the topics were clearly for those with more life experience, i.e. I found the poem about marriage difficult to comprehend. However, I still could connect with some of the topics. For example, the section regarding how to raise children. I agree with his logic in that children should be allowed to make their own decisions, within reason. Children should not be expected to blindly follow what their parents think is the right thing to do, because everyone has their own moral compass guiding them. And after all, do we always learn a lesson just by listening to our parents? No. Often it takes trial and error. And I believe many of life’s lessons are learned through experience not purely by listening to teachings or lectures. Overall, I would definitely recommend reading the book and/or watching the film. Both are educational and inspirational, in ways that can apply to everyone. 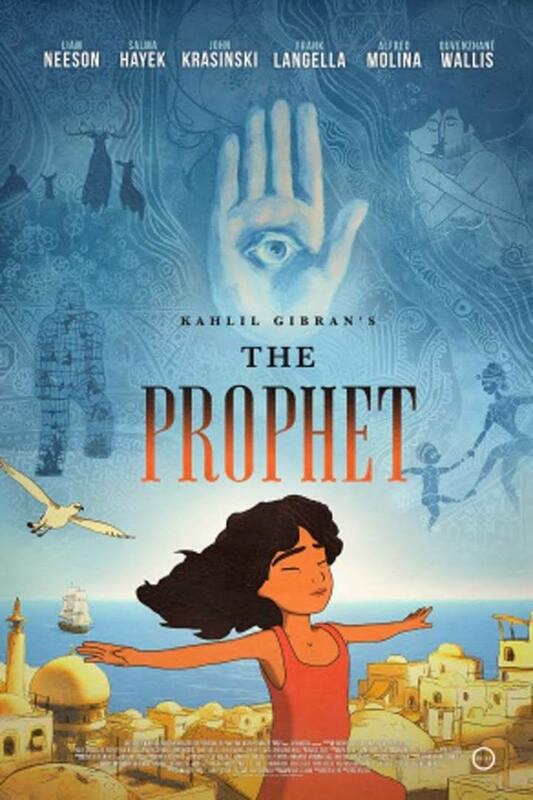 The film’s source material, The Prophet, is available to check out from the Mission Viejo Public Library.